Last Valentine’s Day, Gray proposed to his lovers, Jack and Mason. The three of them can’t legally marry, but they’ve spent the summer planning a formal commitment ceremony. And nothing—not nerves, Gray being assigned the case from hell, or the August heat—will keep them from saying their vows in front of their friends. Then they’ll declare their love for each other in the way they’re most comfortable, privately, in bed. 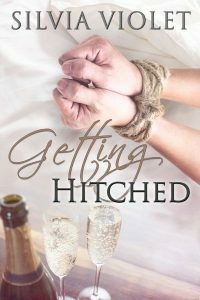 Join Gray, Jack, and Mason as they prepare to get hitched. “You two will, at least.” But Gray was mostly joking. He might not enjoy it as much as them, but he would still have fun. “He’s so not going to admit it,” Mason added. “I’ll give you some thanks,” Jack said. He lifted Mason’s legs so he could slide to the floor. Then he crawled slowly toward Gray. Jack’s mouth dropped open in a parody of shock, and Mason snorted. “Of course not. We would never do that,” Mason added. Gray couldn’t help but smile. “Yeah, it will be.” Especially if he actually managed to say the vows he’d written without choking up.